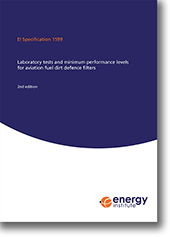 This publication provides industry with general mechanical specifications for new aviation fuel dirt defence filter designs, laboratory qualification test procedures and minimum laboratory performance levels for selected aspects of the performance of dirt defence filter elements and systems. The laboratory qualification tests provide standard methods of evaluating the performance of new dirt defence filter element designs, which may be relevant to field service. They are not intended to predict the actual performance of dirt defence filters in field service. Dirt defence filters that meet the qualification requirements of EI 1599 may be used as in vessels formerly used as filter monitors. Dirt defence filter systems should be used in conjunction with a water removal or water detection device that will ensure free water content in fuel is acceptable for servicing aircraft. The inclusion of a new category of dirt defence filter of six-inch nominal diameter, with an in-to-out flow format. Inclusion of open end cap dimensions (identical to those in EI 1583 7th edition). Inclusion of the option for the fuel used for testing to meet a national standard for kerosine-based jet fuel (rather than ASTM D1655 or Def Stan 91-091) by agreement with the user. Replacement of compatibility test protocols with the requirement for compatibility testing to be undertaken in accordance with the most recent edition of EI 1589 Materials compatibility testing for aviation fuel filter elements and fuel sensing devices. Clarification that materials compatibility testing is not required as part of annual production quality conformance testing. This publication will be of particular interest to all those involved in the manufacture, supply, procurement and use of aviation fuel filters, particularly for aircraft fuelling.